We all get them, but how do you know you have received a scam email? I just received an email from Netbank with the subject “Security Notification”. I even get emails from banks I don’t even bank with telling me to change my password. How do you identify a scam email? In the body of the email, there will always be a link or button they want you to click on, e.g. https://www.my.commbank.com.au/netbank/Logon/Logon.aspx. The trick is to put your cursor over that link to see if it is the same as the address you can see. The real address is displayed in the bottom left hand corner of your browser. Whatever you do DO NOT click on the link. If it is a scam, then these will be different. See image below showing the link and the actual address. My advice is to delete the email and don’t let the scammers waste another second of your time. 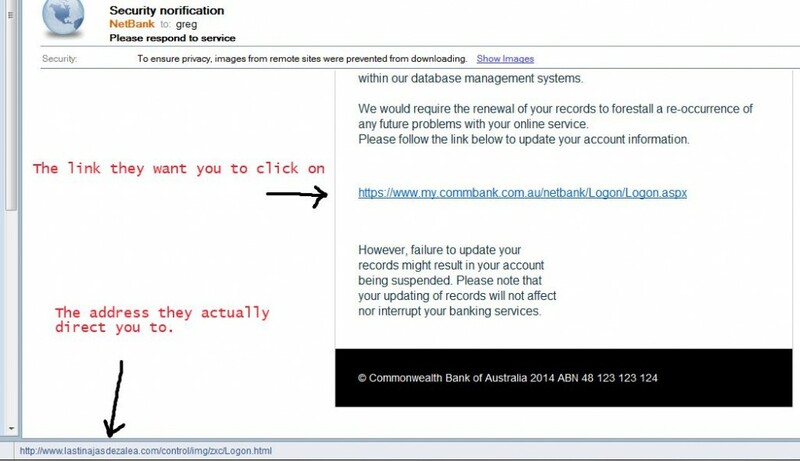 I hope this advice has helped you avoid online scams. This is a very funny video on how handle Spam email and on-line scammers.